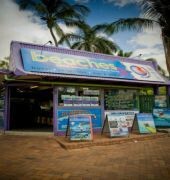 Beaches Backpackers Airlie Beach is located in the heart of Airlie Beach, just across from the waterfront and Airlie Beach's Lagoon swimming pool. Beaches' unique central position and popular Bar & Restaurant provides nightly entertainment and offers the best of Airlie Beach's famous nightlife. As we are a licensed bar you must be over the age of 18 to stay with us.